To evaluate whether circumferential strain assessed by magnetic resonance imaging (MRI) using strain-encoded imaging (SENC) allows objective description of left ventricular (LV) function and scar in patients with acute myocardial infarction (AMI). MRI was performed to 14 consecutive patients 3 ± 1 days after AMI (1.5 T, Philips, the Netherlands). True cine sequences of 3 long-axis views (2-, 3- and 4-chamber) and 3 short-axis (SA) views (basal, mid, and apical) were acquired using a Steady State Free Precession (SSFP) sequence. After that, SENC cine images  were acquired on the same long-axis planes to measure the circumferential strain. Finally, using the same plane orientations, multslice contrast enhanced MRI (CE-MRI) with an inversion-recovery (IR) sequence covering the whole ventricle was conducted after the injection of 0.2 mmol (Magnevist®, Schering, Germany) and waiting for 15 minutes. 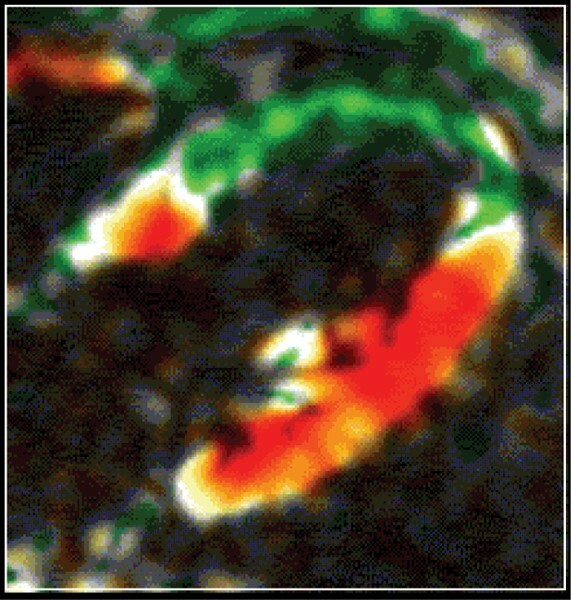 The circumferential strain was measured from the SENC images by two independent observers using a dedicated software (SENC, Diagnosoft 1.01) and was calculated for each segment in a modified 17 segment model. Wall motion was evaluated semi-quantitatively from the SSFP cine sequences by consensus reading of two blinded observers as normokinetic, hypokinetic or akinetic. CE-MR images were analyzed to quantify the size and transmurality of the scared myocardium using a regular workstation (Viewforum, Philips, the Netherlands). Receiver operator's characteristic curve (ROC) analysis was done to the strain measurements. In total, 252 segments were analysed from which 6 segments had to be excluded due to insufficient image quality. Circumferential strain assessed with SENC was significantly reduced in regions defined as hypokinetic or akinetic by cine MRI as compared to normokinetic regions (normokinetic: -19 ± 8.19%; hypokinetic: -8 ± 5%; akinetic-1.3 ± 3.9%) with (p < 0.001), respectively. Using ROC-analysis, in dyskinetic regions peak systolic circumferential strain was reduced with a sensitivity and specificity of 90% (cut-off value -12%, ROC area 0.941, 95% CI 0.901–0.969). Impaired circumferential strain was also detected in regions with myocardial scar with a sensitivity of 81% and a specificity of 92% (cut-off value -10%, ROC area 0.895, 95% CI 0.849–0.930). The interobserver variability for SENC was excellent (r = 0.94). SENC MR imaging provides reliable and objective measurements of circumferential myocardial strain which may improve routine comprehensive evaluation of myocardial function and viability in patients with AMI. SENC-image of a patient with anterior myocardial infarction. The green colour is clearly indicating the anterior dysfunctional region whereas in the regions with orange colour strain values are normal. 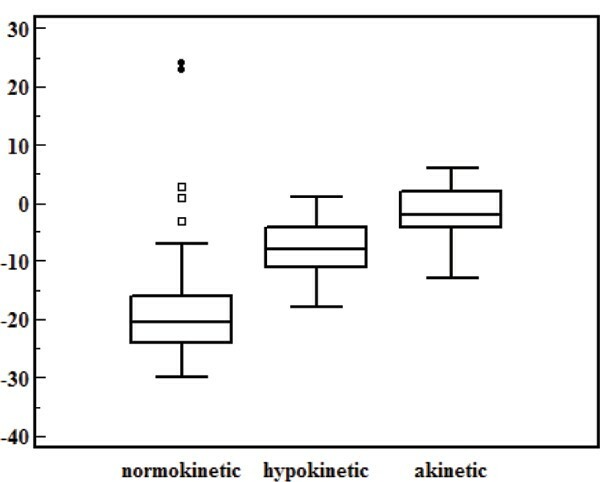 Different circumferential strain-values in normokinetic, hypokinetic and akinetic regions as determined with SENC imaging. Strain-encoding SENC) imaging was used for improved comprehensive understanding of myocardial function in acute myocardial infarction. Circumferential strain determined with SENC was significantly reduced in dyskinetic regions of the heart.